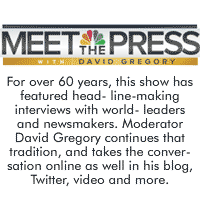 Meet the Press is the audio from the popular NBC Sunday morning show with host Chuck Todd. NBC’s Meet the Press is the longest running show on television, providing insights and analysis into all aspects of politics and the nation’s capital. We ask United States and world leaders the tough questions and gather influential voices to critically examine the answers. We delve deep into the polls and tell you how those numbers can affect your life. And we will make you think, because if it’s Sunday, it’s Meet the Press.